Antonio da Sangallo il Giovane (Antonio Cordiani) was born in Florence. He trained as an architect under his maternal uncles, Giuliano da Sangallo and Antonio da Sangallo il Vecchio. He moved to Rome in 1504. He assisted first Bramante and then Raphael on the rebuilding of St Peter’s, becoming capomaestro after the death of the latter in 1520. Antonio designed Palazzo Farnese for Cardinal Alessandro Farnese (see below) in 1517, but this project was interrupted by his work at St Peter’s from 1520. He seems to have escaped the trauma of the sack of Rome in 1527, and subsequently followed Pope Clement VII to Orvieto. In 1530-3, he took charge of the restoration of Santa Maria di Loreto, summoning a number of other (mostly Tuscan) sculptors as assistants. This group, which included Raffaello da Montelupo and Simone Mosca, subsequently retained its coherence. For example, when Bartolommeo Bandinelli abandoned the execution of the tombs of the Medici popes Leo X and Clement VII in Santa Maria sopra Minerva, Rome 1541, which Antonio had designed, Raffaello da Montelupo was retained to complete the work. Faced with the continuing threat of warfare in Italy and of invasion by Turkish pirates, Antonio was used increasingly as a military engineer. For example, his designed two important fortresses in 1534: the Fortezza da Basso at Florence; and the fortress at Ancona. After the election of Cardinal Farnese as Pope Paul III in 1534, Antonio redesigned Palazzo Farnese on a much grander scale. (It was completed by Michelangelo after his death). Paul III also employed Antonio as an engineer and military architect at Perugia (see below) and at the Farnese Duchy of Castro, as well as at Rome. The rebuilding of St Peter’s accelerated under Paul III, and Antonio’s wooden model (1539) for a new design for it survives there. He also designed the Sala Regia and the adjacent Cappella Paolina in the Vatican Palace at this time. Paul III sent Antonio to open a new canal near the Cascata della Marmore in 1545 to address a chronic problem with flooding (see below). He died at nearby Terni, apparently from a fever that he contracted during this work. Pope Leo X ordered a major restoration of the walls of Amelia in 1513. Sketches (1518) for the project by Antonio da Sangallo il Giovane are reproduced in the Museo Archeologico: the originals survive in the Uffizi Gallery, Florence. Bartolomeo II Farrattini was the Prefect of the Fabbrica di San Pietro in Rome and would have had close links with Antonio da Sangallo il Giovane, who (as noted above) became capomaestro there in 1520. The palace was first documented in his will of 1527. Palazzo Farrattini is a scaled-down version of Antonio’s more famous Palazzo Farnese, which he had built for Cardinal Alessandro Farnese in Rome. (In fact, it probably reflects the original design (1517) for Palazzo Farnese, which was redesigned on a grander scale after Farnese’s election as Pope Paul III in 1534). Antonio's original floor plan for Palazzo Farrattini survives in the Uffizi Gallery, Florence, although the design was simplified before construction. Giorgio Vasari described the resulting palace as "a beautiful and imposing work whereby Antonio [da Sangallo] acquired no little fame and profit". It must have made an enormous impression on Farrattini's more provincial neighbours. The palace was built on the site of the Roman baths (1st century BC), most of which disappeared when it was built, although two black and white mosaic floors (2nd century AD) survive inside, some 4 meters below the present pavement level. These are connected to the subterranean cistern that is now on the opposite side of the road. The only record of the involvement of Antonio da Sangallo il Giovane at Palazzo Vitelli alla Cannoniera comes from Giorgio Vasari’s “Life” of Cristofano Gherardi, il Doceno. Vasari reports that Alessandro Vitelli sent him to Città di Castello, together with Antonio da Sangallo and Pier Francesco da Viterbo, to “repair the walls of the ... garden of Vitelli, which were threatening to fall down”, and that Cristofano Gherardi accompanied him. This was after Antonio da Sangallo and Pier Francesco da Viterbo had completed their work on the Fortezza da Basso (1534-7) in Florence. ✴the five-bay extension immediately to the left of it, which had an open loggia on its ground floor. It is not clear whether this loggia was closed at the time of Antonio’s intervention or soon thereafter. ✴the lozenge-shaped Cappella del Corpus Domini (later Cappella Jacobilli), off the right wall of the left transept. Antonio da Sangallo il Giovane was documented in Foligno in 1525, when he requested and was granted citizenship. Antonio da Sangallo il Giovane occasionally visited Orvieto in 1513-4 to advise on the construction of the facade of the Duomo (see below). •Sorgente del Leone, further below Porta Postierla. ✴His visit in 1526 addressed the city’s fortifications. In March 1527, just two months before the sack of Rome, the Consiglio General made Antonio a citizen of Orvieto. It was at about this time that he began work on Pozzo della Cava (below). 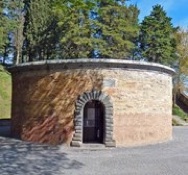 The local historian, Pericle Perali records that Antonio built the cistern in Piazza del Popolo during the governorship of Antonio Ricasoli (1528-32). In 1532, the Commune gave him part of the Palazzo dei Sette along Via della Mercanzia on condition that he construct a palace there within 10 years. (In the event, he did not meet this condition and the site reverted to the Commune). They called him back to Orvieto in 1533, after the collapse of a large section of the city wall. Antonio was present in Orvieto during the ceremonial visit to the city of Paul III, in September 1536. 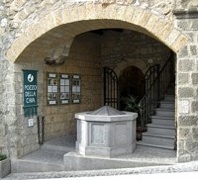 A record made at the time describes an temporary arch erected at this time to the design of “Antonio di S. Gallo, il quale habita qui” (who lives here). In fact, his other papal duties meant that he only occasionally returned to Orvieto after this time. Antonio left his mark on the Duomo over a period of nearly thirty years. The Opera dell’ Duomo sent Michele Sanmicheli (capomaestro in 1509-25) to Rome in 1513 to consult Antonio da Sangallo il Giovane on the façade, and this seems to have led to occasional visits by Antonio to Orvieto in 1513-4. Antonio da Sangallo il Giovane completed the upper cusp and began the spire to the right of it in 1530. A cross was placed at the apex of the cusp on 1st January 1531. Further work on the spire is documented in 1533. This altar on the left wall of the right transept of the Duomo, formed part of the 16th century remodelling. Michele Sanmichele, who became capomaestro in 1509, demolished the earlier work and began the reconstruction of the altar in 1514. The project passed to the Opera del Duomo in 1518, but when Michele Sanmichele left Orvieto in 1526, only the pediment of the monument had actually been built. The Opera del Duomo commissioned a new design from Antonio da Sangallo the Younger: his design for part of the altar, which survives in the Uffizi Gallery, Florence, is annotated “per Santa Maria Orvieto, la cappella che cominciò el Verona [i.e. which Michele Sanmicheli had begun]”. Pope Clement VII, who took refuge in Orvieto in December 1527 after the sack of Rome, was asked to decide between the two designs and chose the former, although the side pilaster shown in Antonio da Sangallo’s design was used in the structure that was actually built. Antonio da Sangallo arranged for Simone Mosca to take over the project in 1535. According the Giorgio Vasari, “there was summoned, at the suggestion of Simone, his very dear friend Raffaello da Montelupo” to work on the central relief under the arch. A document records that Simone Mosca acted as host to Antonio da Sangallo when he made a short visit in 1536 to introduce Raffaello da Montelupo to the authorities. The chapel was finally completed in 1546. Paul III commissioned a design from Antonio da Sangallo il Giovane for a new ceiling for the nave. The design survives in the Uffizi Gallery, Florence. Work on the ceiling began in 1538-40, but it was subsequently abandoned. During his visit to Orvieto in 1540, Paul III mandated that the choir should be moved from the first bay of the nave to the apse. Antonio da Sangallo il Giovane supervised the work and also designed the new pavement featuring Farnese lilies for the part of the nave that was exposed when the choir was removed. The area in front of the the facade of the Duomo (see Walk I) was cleared and levelled in 1556, apparently to a plan that had been made some decades earlier by Antonio da Sangallo il Giovane. A letter discovered in 1999 reveals that Clement VII commissioned Antonio da Sangallo il Giovane to excavate a deep cylindrical borehole in what is now Via della Cava, which dated back to Etruscan times. (Some of the tufa that was extracted in the process was reserved Palazzo Pucci - see below). The site was subsequently excavated to reveal a complex of caves dug out of the tufa that had been in use for various purposes since Etruscan times. The excavations were opened to the public as a private museum (the Museo del Pozzo della Cava) in 1996. The museum's excellent website provides a virtual tour round the fascinating caves. The present wellhead (illustrated above) was installed in 2004, when the arch under which it had originally stood was re-opened. As noted above, Antonio di Sangallo il Giovane discovered the Sorgente di Santo Serio here in 1525. His work on what became known as the Pozzo di San Patrizio seems to have begun soon after Clement VII took refuge in Orvieto in December 1527. However, the first record of the project dates to 1530, when Clement VII (now back in Rome) wrote to the governor, Antonio Ricasoli authorising him to raise a new tax partly to pay for it. Excavations on this site were complete by early 1532 and the 30,000 bricks needed for the construction arrived in Orvieto in 1534. "It was on a day in April [1534 ... Clement VII and I] talked a little on this subject: he praised my medals, and said they gave him the greatest satisfaction, but that he should like another reverse made according to a fancy of his own ... His Holiness then commissioned me to design the story of Moses when he strikes the rock and water issues from it, with this motto: Ut bibat populus [in order for the people to drink]. This medal, which is illustrated on a web page by John Paul Adams, is in the British Museum, London. The well is over 50 meters deep. Two concentric spiral staircases of 250 steps allowed for one-way traffic down to the water and back up again, so that the donkeys plodding up and down to bring water to the surface did not need to turn. The steps were lit and ventilated by 72 windows in the inner wall. Construction remained incomplete when Paul III visited the city in 1536. Probably at the behest of Antonio da Sangallo il Giovane, Paul III commissioned Simone Mosca to complete the work, which he insisted should be completed by the following March. His intervention is commemorated by the frieze of Farnese lilies on the brick course at ground level. The inscription below it translates: "What nature has not provided for the defence [of the city - i.e. water], human industry has added". Etruscan artefacts found during the excavations for the well provided the first indication of the existence of the nearby Etruscan temple now known as the Tempio del Belvedere. In the 19th century, the Servite monks from nearby Santa Maria dei Servi seem to have likened the well to the Purgatorio di San Patrizio (Purgatory of St Patrick). This was a cave on an island in Loch Derg in Ireland that St Patrick is thought to have discovered, which became a place of pilgrimage where pilgrims sometimes experienced visions of purgatory. The Florentine banker Raffaele Pucci commissioned Palazzo Pucci from Antonio da Sangallo il Giovane. As noted above, some of the tufa that was extracted during the excavation of the Pozzo della Cava was reserved for it. Antonio’s design survives in the Uffizi Gallery, Florence. The surrounding streets are identified in the design: the palace would have occupied a site of some 3,00 square meters, bounded by Corso Cavour, Via del Duomo, Via Signorelli and Via dei Cartari. It is not clear how much of it was ever built, but no securely identified remains survive. ✴The wellhead in the cloister of San Giovanni Evangelista was probably built in or soon after 1532, when the canons of received money from the Commune for a cistern here. ✴The wellhead in Piazza del Popolo, which bears the arms of Clement VII and the papal governor, Antonio Ricasoli (1528-32), is of similar design. Antonio da Sangallo il Giovane was commissioned to provide a model for a new public palace to replace the Palazzo Comunale in 1532. The project stalled until 1573, when Ippolito Scalza was commissioned to rebuild the palace according to this design. In fact, Scalza’s design, which survive in the Museo dell'Opera, seems to have been very much his own. Cardinal Tiberio Crispo, who was probably an illegitimate son of Paul III, was inscribed as a noble of Orvieto in 1540 and became a canon of the Duomo. He commissioned Antonio da Sangallo il Giovane to design this palace (later Palazzo Crispo Marsciano): the design survives in the Uffizi Gallery, Florence, in a folio that also contains a design (ca. 1536) for a new ceiling for the nave of the Duomo. Construction was probably underway by 1543, but it seems that only the ground floor was complete when Antonio died three years later. It seems likely that Raffaello da Montelupo, with whom he had close links, took over the project. However, the work proceeded intermittently, and the palace was still incomplete when both Cardinal Crispo and Raffaelo da Montelupo died in 1566. 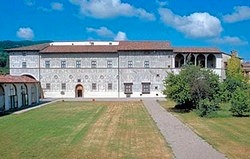 Ludovico Marsciano bought the incomplete palace in 1582. The work he commissioned, which included the windows in the upper storeys, is attributed to Ippolito Scalza. A design for Palazzo Gualterio by Antonio da Sangallo il Giovane survives in the Uffizi Gallery, Florence. It was probably built to this design by Simone Mosca: according to Giorgio Vasari, he “executed ... the ground plan and facade of the house of Messer Raffaello Gualtierio, father of the Bishop of Viterbo, and of Messer Felice, both noblemen and lords of great excellence and reputation”. (Raffaele and Felice Gualterio were respectively the son and nephew of Sebastiano Gualterio, who was bishop of Viterbo in the period 1551-66). Cardinal Francesco Armellini commissioned this design from Antonio da Sangallo il Giovane for a new college in Piazza Sopramuro (later Piazza Matteotti - see Walk II). The designs survives in the Uffizi Gallery, Florence. The project was aborted after the death of Cardinal Armellini in 1527. ✴its east facade, on the site of the palace of Gentile Baglioni, respected the surviving remains of the Etruscan city walls, and incorporated Porta Marzia (see below) as its main portal. This palace was linked by a fortified corridor to a new fortress, the Fortezza di San Cataldo, which was to act as a safe haven for the inhabitants of the new palace, in the way that the Castello di Sant' Angelo served the residents of the Palazzo Vaticano, Rome. The foundation stone of the new palace was laid in November 1540. It seems likely that Pier Luigi Farnese intended it for his own use, but his attention soon moved to the more prestigious possibilities of Parma and Piacenza. His son, Ottavio Farnese, whom Paul III initially intended that should rule Perugia as "Perpetual Captain", visited the site in March 1541, and was apparently content. Its construction was largely complete by September 1541, when Paul III visited Perugia. However, he is reported to have said: "Questo non basta: voglio che vi si faccia una fortezza" (This is not enough: I want you to build a fortress). Whether or not this is true, it is certain that this change in design was subsequently made. It could have occurred after the assassination of Pier Luigi Farnese, which led to the elevation of Ottavio Farnese as Duke of Parma and Piacenza and hence his loss of interest in Perugia. Under the new plan, the palace walls were replaced by the forbidding curtain walls of Rocca Paolina, complete with a moat. The original nine entrances were replaced by a single entrance to the north, which was protected by a drawbridge. The new project required the demolition of Santa Maria dei Servi and of a stretch of the Etruscan wall, including Porta Marzia (see below). The design of the Fortezza di San Cataldo was correspondingly reduced in scope. The part (if any) played by Antonio in the revised project is unknown, but he was not documented in relation to it after 1542, when Galeazzo Alessi arrived in his native Perugia in the train of the new papal legate, Ascanio Parisani. However, his obvious respect for the ancient fabric of Perugia (which is demonstrated by a number of his plans for the palace that survive in the Uffizi Gallery, Florence) is usually credited with the survival of the upper part of Porta Marzia: while the new plans required its demolition, the remains of its upper part were embedded in the fortress the walls, close to its original position. (The original travertine abutments can be seen about 4 meters behind the present wall). The major part of the fortress was demolished in 1860, almost as soon as Perugia became part of the newly-formed Kingdom of Italy. The Rosci family built Palazzo Rosci, which subsequently passed to the Bianchini Riccardi family. It is attributed, somewhat unreliably, to Antonio da Sangallo il Giovane. Antonio di Sangallo il Giovane was consulted in Orvieto in 1531 by the Fabbrica of the Tempio di Santa Maria della Consolazione, and travelled to Todi in 1532. A sketch by Antonio di Sangallo il Giovane, which survives in the Uffizi Gallery, Florence, relates to the construction of conventual buildings around the main apse of this church. This was associated with the decision in 1532 to cede the church to a community of Hieronymites (hermits of St Jerome) at Fiesole, but these plans came to nothing. The Cesi family commissioned Antonio di Sangallo il Giovane to build Palazzo Cesi on a site next to Palazzo Vescovile. Pietro Cesi and Angelo degli Atti (the owner of the other adjacent palace) entered into a fierce dispute over the site, and matters became so heated that Pietro Cesi murdered Angelo degli Atti and other members of his family in 1553, at the end of a banquet in the Atti’s castle at Casigliano (also, ironically designed by Antonio di Sangallo il Giovane). It remained the property of the Cesi family until 1741. The inscription [over the portal] records the fact that it then passed to the poet Paolo Rolli, who translated the works of Milton into Italian. The portal (ca. 1600), which was probably commissioned by Bishop Angelo Cesi, is attributed to Ippolito Scalza. Return to Art in: Amelia Città di Castello Foligno Orvieto Perugia Terni Todi. Return to “Foreign” Architects in Umbria.